We may not get to enjoy the beautiful fall colors and activities here in California, but we still get to enjoy all the delicious flavors that come along with it. And now that I have an AC unit (thank you, Aunt Sylvia! ), I’ve been taking full advantage of my stove. Roasted vegetables, hearty soups, and spiced baked goods have been on the menu this season. Nothing makes my tummy smile more than the scent of fall coming straight from the oven. 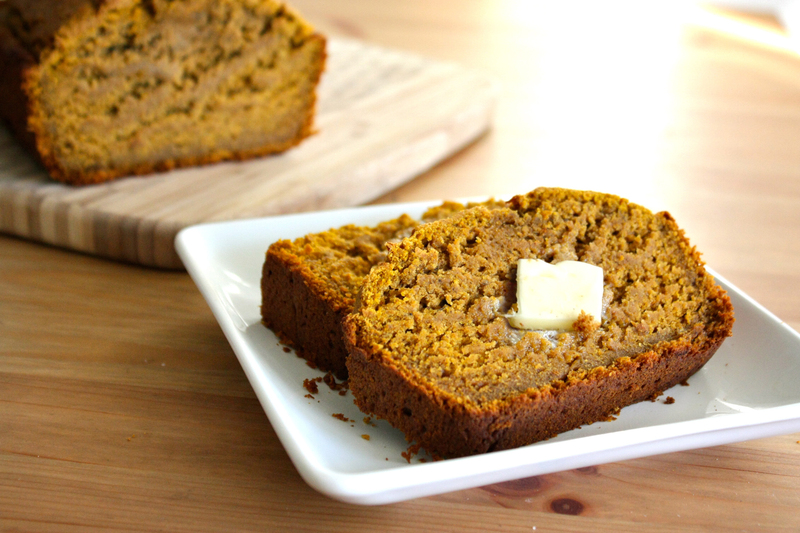 One of my favorite fall foods is, of course, pumpkin. Growing up, as soon as the leaves started to change there were two dishes on my mind—my dad’s spicy pumpkin soup and my grandma’s best friend’s famous pumpkin pie (so.good.not.kidding.want.now). The earthy, yet sweet flavor of pumpkin makes it a very versatile ingredient, and I’ve been experimenting using it in savory and sweet dishes. I had a couple bananas on the verge of death this week and I’ve been trying really hard to not waste any produce, so I brainstormed what I could do with them. The obvious came to mind—banana bread—but I had a scented candle lit, so I was inspired to “fall” it up a bit. I had like 5 cans of pumpkin puree in my cupboard (you never know when there’ll be a shortage, I swear there’s one every year), so I thought AHA! pumpkin banana bread, let’s do this. I found what I thought seemed like a good recipe online and tweaked it up a bit, basically swapping ingredients to fit whatever I had in the cupboard. I used oat flour instead of regular flour (hence gluten free) and brown sugar instead of white. I also used less sugar/honey than the recipe called for because I don’t like overly sweet things. I blame my mom for that, she was always putting half the amount of sugar in our Kool-Aid growing up. Not cool, Rita. I’m happy to say this fall baking experiment turned out quite well. I did get my hair caught in the mixer while I was making the batter, but that’s neither here nor there. The flavor was great with those warm fall-y pumpkin spice notes and a hint of sweet from the banana. The texture was moist and dense, almost like a pound cake. I baked it about 10 minutes shy of the recipe because I was afraid of it drying out, but I think there was enough moisture from the ingredients, I could’ve gone the full time. As always, feel free to tweak up the ingredients as you like, this doesn’t HAVE to be gluten free! In a large mixing bowl combine banana, pumpkin, eggs, oil, honey, and sugar. Mix on a low speed until blended. In a medium mixing bowl combine remaining dry ingredients and mix well. Slowly add the flour mixture to the pumpkin mixture, and mix on low until just combined. Spray loaf pan with non-stick cooking spray and pour batter into the pan. Bake for 60 minutes or until a toothpick comes out clean from the center. Definitely making this – I have overripe bananas waiting to be transformed. And just a side note, I believe it was in your favor that you don’t like overly sweet things, and I am happy to take credit (your grandmother Mildred actually started it). On the reverse side, a friend at work calls himself a sweet addict and he too blames his mother – and I quote, “It’s my mother’s fault for feeding me chocolate cake and day-old doughnuts for breakfast.” You’re welcome 🙂 Keep the yummy, interesting, and entertaining blogs coming! Chocolate cake and day-old doughnuts for breakfast—now THAT’S what I’m talking about. 😉 Haha just kidding. Thank you for your kind words, as always.